Diablo III Season 1 is planned to end on February 3. The following week three of the developers will be part of a Tavern Talk discussion about Seasons. Wyatt Cheng, Travis Day, and Don Vu will join Brandy "Nevalistis" Camel in a live Twitch video chat. They will discuss how Season 1 went, their ideas for future Seasons, and the start of Season 2. The fun starts at Tuesday, February 10 at 11:00 AM PST (2 PM Eastern time). 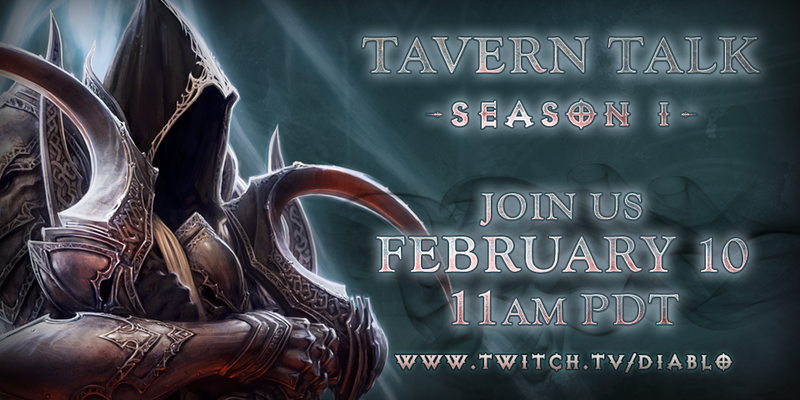 Tavern Talk is back and this time we’re taking a retrospective look at Season 1. Join us on Twitch February 10 as we share what we've learned and where we're headed for the future of Seasons! To celebrate the start of Season 2, we'd like to take some time to discuss our philosophy behind Seasons in Diablo III, cover lessons we learned from Season 1, and share some of our plans for the future with you, our community. On Tuesday, February 10 at 11:00 a.m. PST, we'll be chilling out in the Blizzard Studio to cover all these topics (and possibly more) as well as answer your questions live! After we go around the table to discuss Seasons in detail, we'll open up the floor to player questions. Got a question for our developers about Seasons? Then be sure to send it to @Diablo on Twitter using #D3QA right now or leave it in a comment below! If you're not able to tune in live, don't break a sweat—we'll upload a VOD of the entire chat to our Twitch and YouTube channels shortly after the stream for your leisurely viewing pleasure. We're stoked to see you there!